Having an accurate shopping list that contains exactly what you need to buy is a necessary ingredient to an efficient shopping and an enjoyable cooking time. – ingredients that you already have on hand, like common spices and condiments, water, etc. – ingredients that are listed two times under different names, like flour and all-purpose flour, butter and unsalted butter. – ingredients that you don’t use, as you prefer a substitute, for example butter instead margarine, low fat milk instead of milk. 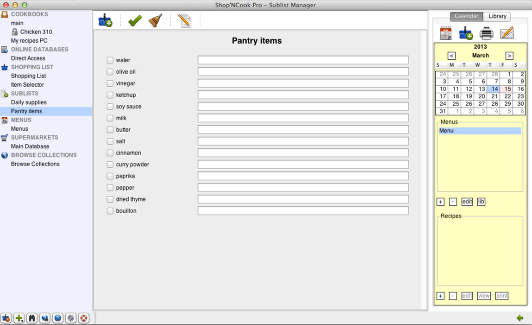 Shop’NCook recipe software implements two mechanisms that allow you to have exactly what you want on your shopping list and nothing else: these are the pantry and the list of substitutions. This tutorial shows you step-by-step how to enable the pantry and list of substitutions and tailor them to your needs. It shows also how substitutions affect the recipes, shopping list, nutritional analysis and costing. Click on the Preferences button ofthe mini-toolbar to open the preferences. 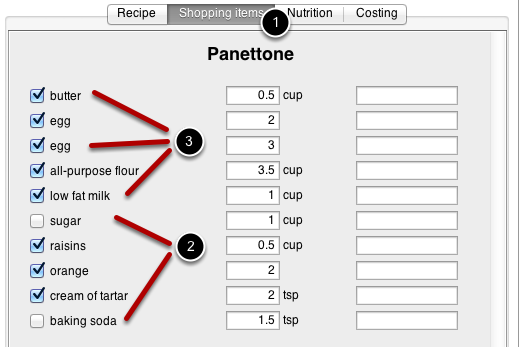 Display the Shopping List tab (1), then select the checkboxes next to “Enable the pantry” (2) and “Enable the substitutions” (3). 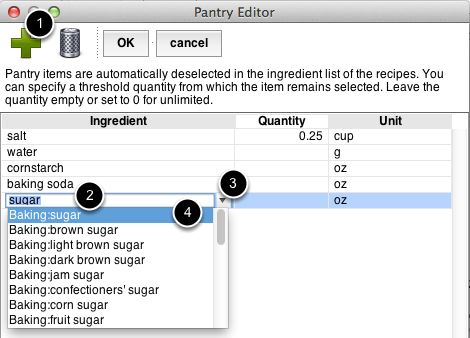 Click on the “Edit List” button next to “Enable pantry” to open the pantry editor. To add an item to the pantry, click on the + button (1), type the name of the item in the field (2), click on the arrow to display the corresponding items of the database (3), and select the appropriate item (4). 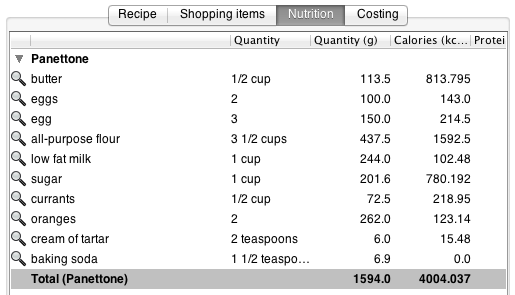 When you add ingredients from a recipe to the database, the items in the pantry are by default not added to the shopping list. You should add to the pantry all the items you keep usually on hand, like water, salt, pepper, common spices, and staples like sugar, pasta, rice, etc. You have also the possibility to specify a threshold quantity, that is a quantity above which the ingredient is added anyway to the shopping list. This is useful for ingredients that you keep on hand in limited quantity, and need to purchase additional quantities when a lot is required. You can use it for example for perishable items of which you cannot keep large stocks, like milk and eggs. To specify a threshold, input a quantity (1), click on the arrow of the unit pull-down menu (2) and select the threshold unit (3). 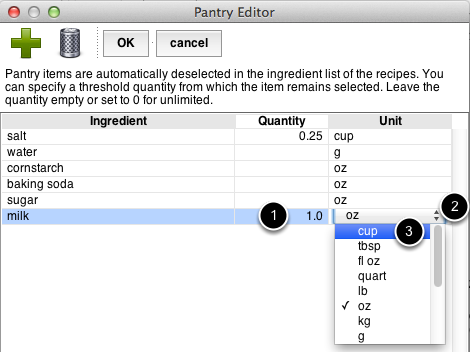 If you input 1 cup for example, the item will only be added to the shopping list when the required quantity is larger than one cup. Click OK to save the modifications and close the pantry editor. 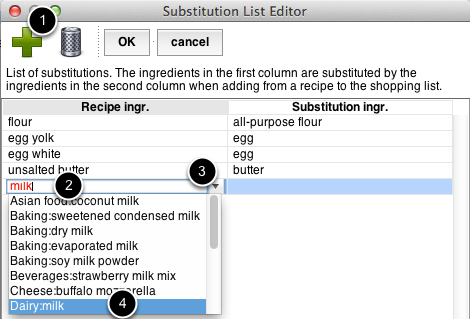 In the Shopping List tab of the Preferences, click on the “Edit List” button next to “Enable substitutions” to open the substitution editor. To add an item to the list of substitutions, click on the + button (1), type the name of the item you want to subsitute in the new field on the left (2), click on the arrow of the pull-down menu (3) and select the corresponding item of the database (4). Similarly, type the name of the substitute in the field on the right (1), click on the arrow of the pull-down menu (2) and select the corresponding item of the database (3). In the example, milk will be replaced by low fat milk in the shopping list. You can substitute items to avoid duplicates in the shopping list of equivalent items that have different names (for example “flour” and “all purpose flour”, “butter” and “unsalted butter”). They can also be used to help you reach your nutritional goals by substituting lower-fat or more nutritious ingredients, or for health reason to avoid ingredients to which you have an allergy for example. Click OK to save the list of substitutions and close the editor. Click OK to save and close the preferences. 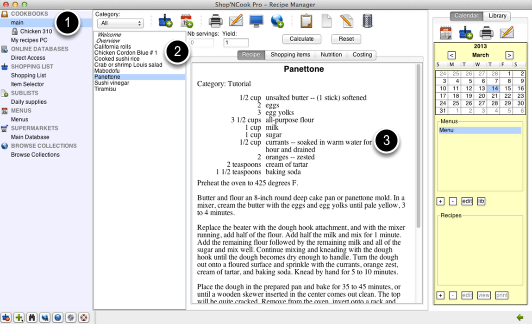 Select a cookbook (1) and a recipe (2) to display the text of the recipe (3). The recipe above contains several ingredients that we have added to the pantry – milk, sugar and baking soda – as well as ingredients that are in the subtitution list: unsalted butter should be replaced by butter, egg yolk by egg and milk by low fat milk in the shopping list. 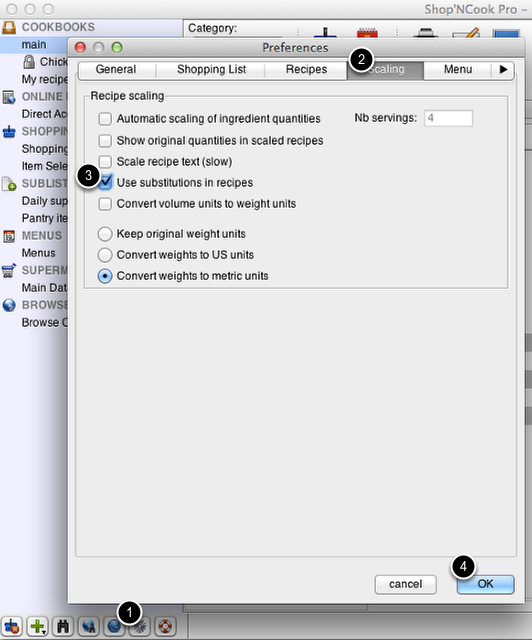 Click on the Shopping Item tab of the recipe (1). It displays the ingredients as they will be added to the shopping list. The ingredients belonging to the pantry have been automatically deselected by the software, so that they will not be added to the shopping list by default (2). The ingredients in the substitution list have been replaced by their substitutes (3). It is still possible to add items that are in the pantry to the shopping list. For that, check simply the items you want to add in the Shopping Item tab of the recipe (1), before clicking on the “Add to Shopping List” button (2). In order to see at a glance what is missing in the pantry and replenish it conveniently, I recommend to create a sublist that contains all the pantry items. In this way, you can add to the shopping list the pantry items that are low in stock or missing with just a few clicks. 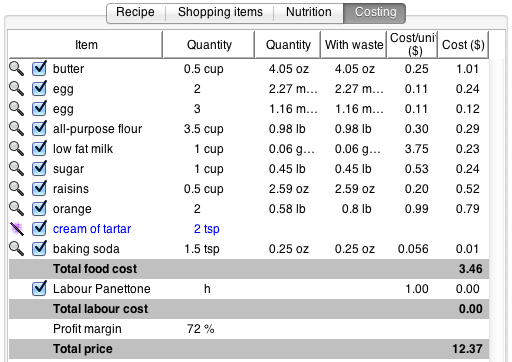 The costing of the recipe uses the substituted ingredients, that the software computes the cost of the ingredients that are actually purchased to make the recipe. 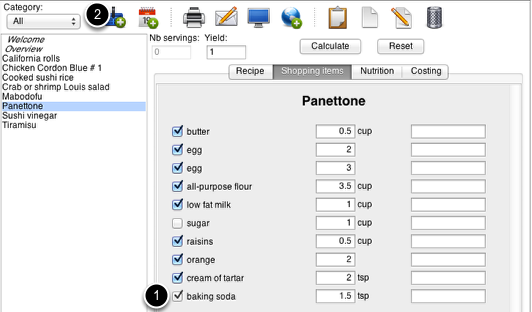 In the recipe for Panettone above, the cost is computed with eggs instead of egg yolk, and of low fat milk instead of milk. By default, the substitutions don’t modify the recipe itself and its nutritional analysis. It is however possible to enable the substitutions in the recipes and nutritional analysis in the preferences. 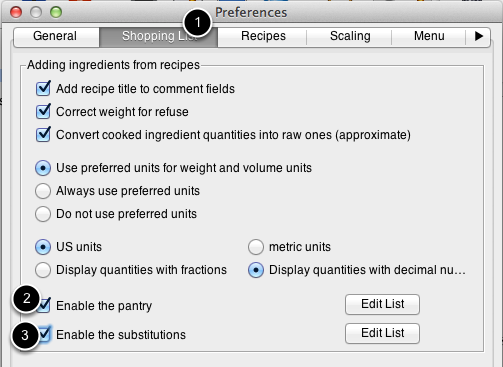 To do that, open the preferences (1), display the Scaling tab (2), check “Use substitutions in recipes” (3), then click OK to save the preferences (4). After enabling the substitutions in recipes, the nutritional analysis uses the substituted ingredients instead of the original ingredients. In the above example, milk has been replaced by low fat milk and egg yolk by egg in the nutritional analysis of the recipe. Note that if you enable subtitutions in recipes, you should only make substitutions with ingredients that replace completely the original ingredient in recipes. Substituting egg yolk by egg for example is not recommended in this case since it yields a wrong nutritional analysis.